The tomatoes are purple, broad-bottomed, flecked with green. These are not my backyard Sungolds. They’re Cherokee Purple heirlooms, hefty in my hand, and they come from east of the mountains where it actually gets hot. They’re rare visitors in my kitchen, but I know just what to do with them today. Raw tomatoes, lemon, dill, garlic. A few chopped olives add spots of brine and salt. 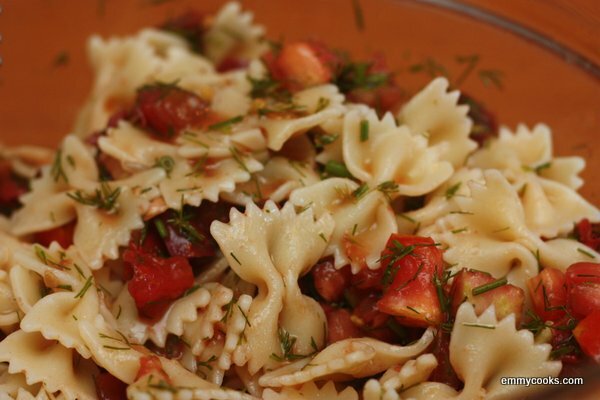 The hot pasta soaks up tomato juice, releases the aromas of summer tomato and dill. The garlic and lemon jostle each other in the background. Be sure to serve with plenty of crusty bread for soaking up all the tomato juice. 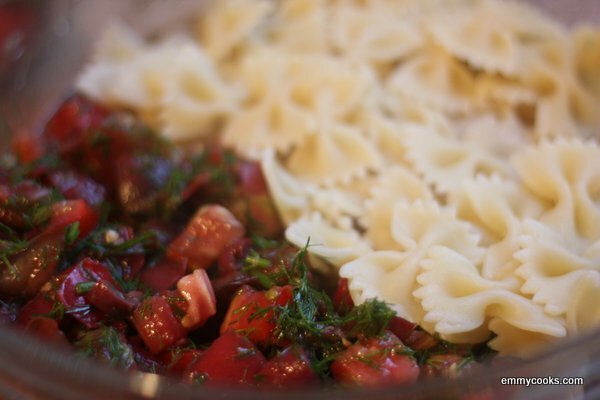 Fresh Tomato Pasta with Dill and Lemon: Put on a pot of water for pasta, then add salt and begin cooking pasta when the water comes to a boil. Meanwhile, chop a few big juicy tomatoes into a wide bowl, then add 1/2 c. finely chopped dill, the zest of a lemon, 2 Tb. each olive oil and lemon juice, a pressed or grated garlic clove, 1/2 tsp. salt, and a handful of chopped kalamata olives. Stir and set aside. When pasta is cooked, drain it and toss with tomato mixture. Taste and adjust seasonings. Serve with crusty bread and a salad. This entry was posted in Emmy Cooks Original, Food, Noodles, Recipes, Vegan or Would-Be-Just-As-Good-Vegan and tagged CSA recipes, fresh tomato sauce, pasta, pasta recipes, summer recipes, tomato recipes, vegan, vegetarian on August 15, 2012 by emmycooks. I love simple recipes that use the vegetables of summer. Very colorful! This sounds like such a fresh and tasty pasta salad! I haven’t made one yet this summer, and this may just be it! I’ll bet that’s pretty good cold as well. I’ll have to try that soon. Never thought to pair dill and tomato! So summery! Have to try dill and tomatoes…a very different flavor than the basil, marjoram or thyme we would normally use…but it sounds/looks great! How I love fresh pasta, this looks so good I have to try it as soon as it obols down a bit here. Portland is hitting the 100 mark today. Good thing for me this is a somewhat rare occurrence! Never heard of combining tomatoes and dill! Hmmmmm Just tried it… on raw zucchini pastas… divine!!!!!!!! Come and share this recipe with this week’s link party…http://inherchucks.com/2012/08/15/whats-in-the-box-39/. Looking forward to seeing you there! This looks amazing. I do love dill… in fact I love everything in here, just haven’t had them all together. Thanks for nudging me.